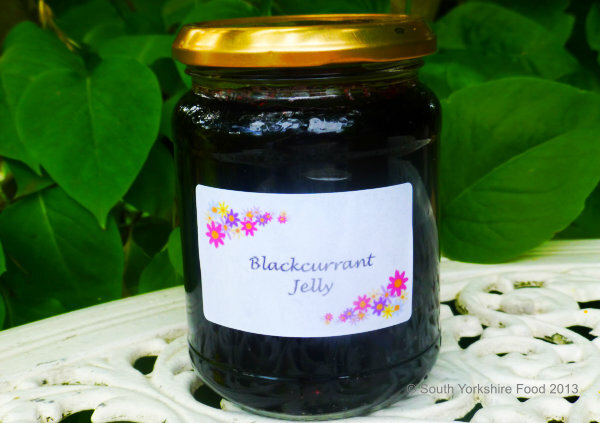 It's Blackcurrant season and my friend Brian has given me lots of them, from the bushes in his garden. There is a definite advantage in making jelly as you don't have to remove all the stalks, which is time consuming and boring! Great on scones or try adding it to sauces to go with roast meats. Makes about six 400g jars. Rinse the blackcurrants and drain well. Put into a large pan with the water and cook until soft and pulpy. Add 500g white sugar per 500ml of juice obtained, stirring until the sugar has dissolved. Bring to the boil and boil rapidly for about 35-40 minutes, removing any scum that comes to the top. After 35 minutes you need to test for set - put a teaspoonful onto the chilled saucer from the freezer, if the edges wrinkle slightly when tipped, the jelly is ready. Keep doing this until the jelly has set to your satisfaction. When the set is right, pour the hot jelly into hot sterilised jars and seal.